From Wikipedia: Mansplaining is a portmanteau of the words man and explaining, defined as "to explain something to someone, typically a man to woman, in a manner regarded as condescending or patronizing." Lily Rothman of The Atlantic defines it as "explaining without regard to the fact that the explainee knows more than the explainer, often done by a man to a woman", and feminist author and essayist Rebecca Solnit ascribes the phenomenon to a combination of "overconfidence and cluelessness." On Facebook and on Twitter, Ted Hand argues that Robert Anton Wilson's work can shed light on the phenomena: "Mansplaining is a useful term because there are gender dynamics involved in the specific form of patronizing or condescending it describes. Failure to recognize these dynamics strikes me as a classic failure of what Bob Wilson called an intelligence test. Bob himself had no problem accepting this basic element of primate dominance dynamics and dramatized mansplaining in several scenes of his novels (see for example the Blake Williams stuff in SC trilogy.)" On Twitter, Ted adds, "Reread the Blake Williams mansplaining to his female student stuff and you'll see what I mean. There is plenty of expose of sexism in illuminatus! as well, see for example Mavis." In the omnibus (3-in-1) ed of the SCT, we meet Blake Williams on pp.28-29, as the stage magician Cagliostro gives his initials from the stage and it's a lot of RAW's biographical stuff: polio, working on quantum psychology, space travel, and being haunted by seeing Reich's books burned at the Vandivoort incinerator. The narrator (or Justin Case) calls Blake "that unbearable bore." Next, pp. 46-47, Blake is that "intolerable bore lecturing on the Birth of Cosmic Humanity to anyone who would listen," and very soon after that, "that lard-assed bore Blake Williams..." P.48 the "windy old baritone sax" Blake Williams is mansplaining at the classic RAW cocktail party scene about how "terrestrial life is embryonic in the evolutionary sense." It goes on. In a certain sense RAW seems to be lampooning himself, but that's too simple. pp. 28-29; 46-54; 57; 68-69; 71-73; 98-100; 112-113; 201-207; 211-213; 235-236; 241-244; 249-251; 265; 267; 274-275; 280; 285; 293-296 (causality); 332; 341; 358; 410-414; 419-422; 424-425; 476; 484-494 (interjecting and present during Cotex's presentation); 504-510; 512; 516; 536-538. 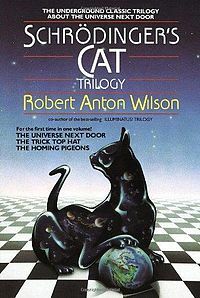 In a different universe, Williams "knew that Value was the Schrodinger's Cat in every equation." Among other publications, Blake Williams wrote How To Tell Your Friends From the Apes and was the "neuroanthropologist" who helped RAW write the quiz on p.10 of Illuminati Papers.He also appears on numerous pages of RWYASN. William Carlos Williams also seemed to see grand significance in small, mundane things. In Mitch Horowitz's book Occult America he covers an American occultist named Benjamin Williams on pp.215-220, but I think Wagner's right: RAW had seen and used Wm Blake as a signifier of intellectual poetic wonder, a strong poet in the use of metaphors, an anti-authoritarian and master of world-construction who would rather make his own "reality" rather than live in the system of some other man's. There's a certain view of poetic "madness" associated with Wm. Blake for RAW (and many of us). Wm Blake in Wilson's work seems to be seen as a liberator from stringent, stultifying, body-denying xtianity, replaced with a "God" that seems isomorphic with "poetic imagination." The "problem" of Blake Williams articulating many of RAW's favorite intellectual riffs while at the same time often being seen as a mansplaining "bore" is an interesting one to me.